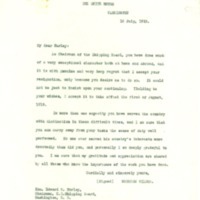 As Chairman of the Shipping Board, you have done work of a very exceptional character both at home and abroad, and it is with genuine and very deep regret that I accept your resignation, only because you desire me to do so. It would not be just to insist upon your continuing. Yielding to your wishes, I accept it to take effect the first of August, 1919. In more than one capacity you have served the country with distinction in these difficult times, and I am sure that you can carry away from your tasks the sense of duty well performed. No one ever served his country's interests more devotedly than did you, and personally I am deeply grateful to you. I am sure that my gratitude and appreciation are shared by all those who know the importance of the work you have done. Although I have been anxious to return to private life, ever since the war ended, I have withheld my resignation, first because I did not want to trouble you while you were in the midst of the international settlement, and second because in view of proposed and announced investigations of the various departments of the government by Congress I wanted to remain long enough to give the legislative committees ample time to make their inquiries. With the extra session already assembled, I feel that the Congressional Committees will have sufficient opportunity between the present date and August 1 to inquire into any matters affecting contracts about which they may have doubt. I have already informed the Chairman of the Senate and House Committees that I am at their disposal. I am hopeful, therefore, that you will find it possible to relieve me on August 1. You will recall that when I retired as Chairman of the Federal Trade Commission it was with no thought of returning, at a later date, to public life. I want to spend more time with my own family. The war, however, forced all of us to put aside our own personal inclinations. When you asked me to serve on the War Council of the Red Cross, and later on the War Trade Board, and finally appointed me Chairman of the Shipping Board, I felt proud of the opportunity to give you and the government the best that was in me. We were put to the necessity of creating an entirely new and enormous industry. We had no time to waste, but the whole nation rallied to the call, and the situation was met. Now that we have a very large portion of the fleet we set out to build, the next large problem is one of operation. I have submitted a plan to Congress, which should form the basis for the discussion which will lead to a permanent ship-operating and shipbuilding policy. I feel that my own work has been done. The Shipping Board and its Emergency Fleet Corporation both are well organized and all that remains is for Congress to work out the legislation that will serve as a compass for the future. In handing you my resignation, please let me express my heartfelt appreciation of your constant aid, counsel and sympathetic cooperation. Your leadership has been an inspiration to all who have served under you. My whole experience as part of your administrative course has increased my faith in human nature.The remembrance of your generosity and kindness, and the satisfaction of having served under your leadership, in so critical a period, will remain with me always. Wilson, Woodrow, 1856-1924, “Resignation of U.S. Shipping Board Chairman,” 1919 July 10, WWP20668, Woodrow Wilson Press Statements, Woodrow Wilson Presidential Library & Museum, Staunton, Virginia.